Take a trip with some of Ireland’s top women writers. 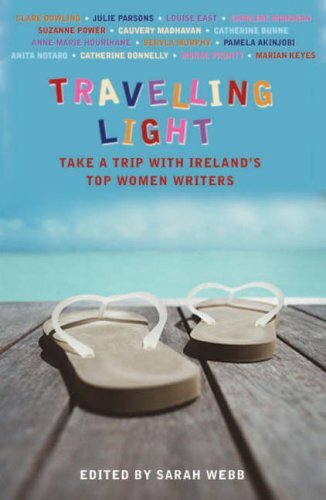 A collection of fascinating, thought-provoking, poignant and funny true-life travel tales from some of Ireland’s top women writers: Claire Dowling, Julie Parsons, Catherine Dunne, Martina Devlin, Martina Reilly, Dervla Murphy, Anita Notaro, Marian Keyes, Martina Conlon-McKenna and many more. Martina Devlin tracks down the perfect amber necklace in St Petersburg; Julie Parsons makes an unforgettable trip by sea from New Zealand to Ireland following her father’s sudden disappearance; and Marian Keyes finds courage and hope in Ethiopia. I’m very proud of this book. I wanted to raise some money for a hospital in Uganda that desperately needed a new children’s ward – Kisiizi Hospital. I have a lot of friends who are also writers (and illustrators), so I decided to ask them for their help in putting together a book in aid of the hospital. I wrote to all my friends, and also some very highly respected travel writers and journalists. Almost every person I contacted said yes, and donated a piece of writing or art (for the chapter headings) to the project. My teenage son visited the hospital recently, and saw the ward the Irish writers helped to built which is still going strong. It was a lovely project to be involved in, and I'm very grateful to all the authors and illustrators who helped make it happen.